I started reading this book on a whim: the movie was coming out in a few days and I decided to skim through it before I see the film adaptation. I didn't really have any expectations for this book, because I never saw zombies as a novel-worthy subject, despite my love for dystopian and sci-fi related things. 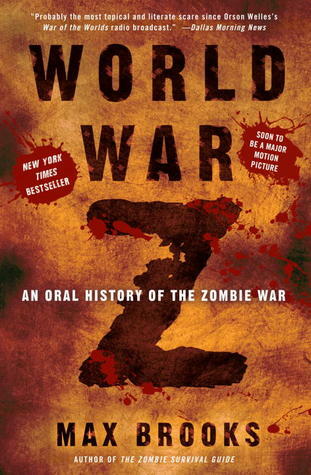 So here I was, just a few pages in and realizing World War Z was worth putting the rest of my life (including sleep) on hold for. What immediately drew me in was the way this book is written: it doesn't follow a specific character, it's not about one person's quest to save the world or their own life - it's a collection of many stories, that paints a picture of humanity as a whole. The narrator, who isn't ever actually named, conducts a series of interviews with people from different countries and socio-economic backgrounds. Those interviews are what the book consists of. I found it to be a unique and thought-provoking commentary on survivalism, politics, corruption and personal gain. Who knew a post-apocalyptic zombie novel could have such deep meaning? World War Z is broken up into eight sections: Warnings, Blame, The Great Panic, Turning the Tide, Home Front USA, Around the World and Above, Total War, Good-Byes. Each section contains multiple stories, ranging in length. I'm not going to lie, the lack of a central character can make the book hard to relate to at times. Personally, I found most of the interviews very interesting, but there were a few I almost gave up on. My favorite was about Colonel Christina Eliopolis from the Home Front USA section: it's one of the longer stories and it's about a pilot, who crashes in zombie-infested territory with nobody but a radio operator to help her. It's not all grim, of course, but don't look for an "all-is-well-again" ending either. All those who survived went through great changes, as one would expect. I loved how different all of the interviews and personalities were, and yet all of them felt unified. I enjoyed the writing a lot for its flow, intelligence and details. I also liked the abundance of footnotes, that were a mix of real life facts and fictional details. I'll admit, I actually got to a point where I started googling them to distinguish one from the other - the seriousness of the book had me caught up. It really does read as a collection historial accounts. I thought World War Z was absolutely brilliant. That being said, I don't think it's for everyone. It's about the human nature rather than the zombies, but a lot of it is also full of terms, ranks and technical details. I feel like it's one of those books readers either love or hate. Once again, I loved it, but I am curious to know what you guys think. Have any of you read this? If not, does it sound appealing to you?